We’ve reached a point in the chronicles that for this week’s Tuesday’s Trials it is time to address working with a potential birthparent. Throughout this post, I will do some switching back and forth between discussing working with a potential birthmother verses birthparents. 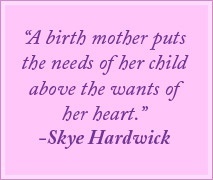 This is applicable to both the biological mother and father. However, with all three of our matches, the biological father was not active in the expectant mom’s life. There are an array of opinions on the best way to work with an expectant mom. There is animosity by some; feeling like developing a relationship with the prospective birthparent(s) makes it more difficult in the end for them to make an unbiased decision. There is a concern that the relationship that develops causes the family to feel an obligation to follow through on their adoption plan. On the other side of the fence are those that want the relationship in place so that both the potential birthparent(s) and prospective adoptive family have a bond and mutual trust once the baby is born. This seems especially true when the plan is an open adoption with the biological family remaining an active part of the child’s life. Having been through three matches, I see both sides and am very aware of the fine line that one walks as prospective adoptive parents. Through adoption forums I have found myself on the receiving end of critique regarding our level of involvement. It is a very awkward situation to be in. Our first match, we only met up with the expectant mom with the plan being that I would attend doctor appointments with her, but her communication and follow through was poor and we never got back together after the initial meeting. We exchanged texts throughout the course of her pregnancy, but there was not an intimate relationship established. The other two matches I was actively involved throughout their pregnancies often going to doctors’ appointments and able to attend all of the ultrasounds. For us, developing a relationship ahead of time was important. I was well aware of the concern that the bond could inhibit her ability to freely make the best decision for her and the baby in the end. I tried to communicate as often as possible that I understood that the decision she had to make would impact her for the rest of her life and despite any bond we formed, she was under no obligation to follow through on her adoption plan. It was a tightrope walk throughout the pregnancies. With our second match, I was unsure if I was doing the right thing by being so involved with her appointments, but I also did not want her to face this alone. She had little support and no one to attend appointments with her. We started out our relationship with the plan for a semi-open adoption with an exchange of pictures and letters, but no ongoing relationship. I think it was the bonding over the course of her pregnancy that allowed us to feel comfortable changing it to a fully open adoption with contact. Had we not had the level of involvement that we did, I am not sure I would have ever been able to be open to that. Our relationship helped us to feel comfortable that she would be an asset to Turkey-Man’s life. For our third match, we knew we wanted something that mirrored what we had with Turkey-man’s birthmother. We did not want a situation where Turkey-man had ongoing contact with his bio-family and our second child did not. The relationship that we had helped us to make sure we were doing what was right for our family. I wouldn’t change what we did at all. However, I do have some advice for anyone working with prospective birthparents. The most important rule is to remember that this is THEIR child and HER body. They are under no obligation for you to be any part of the pregnancy. Whatever level they are comfortable with allowing you to be involved take as a gift. Remember proper terminology. They are not birthparents and she is not carrying your child. By definition, they cannot become birthparents until after the baby is born. And you are not the child’s adoptive parents. You cannot assume that title until after the paperwork I signed. They are referred to as expectant parents or potential birthparents and you are known as prospective adoptive parents (PAP’s). Make sure the line of honest communication stays open and assess whether they remain okay with the ongoing level of involvement. What may have been comfortable when you first matched may not continue to be true. This is a monumental decision the biological family has to make. Its ramifications will impact both them and the baby for the remainder of their lives. As a PAP, you cannot predict the future. While in the moment, it may feel obvious that you would be better equipped to raise a child remember that situations change. God may have you in this role solely to provide support to a family in crisis, not to raise the child. Stay humble and accept whatever involvement they allow as a gift. At the base of it all allow love and respect to rule your decisions. You cannot go wrong operating from that standpoint!